Does not look like Alice or Bob, so let him be Charlie. Charlie has some Goals, and has some means, or Steping-stones to reach them (like resources, knowledge and skills). Ideally, they shall match, i.e. there shall be sufficient Steping-stones to reach the Goal, while goal shall not be within immediate reach distance. Charlie shall put in some efforts to achieve it. If Goals and Steping-stones are balanced, Charlie feels good, and enjoys his challenging but interesting life. 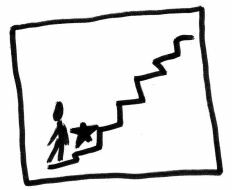 Lets image goal with a star, and Steping-stones with stairs. Fig. 1. Goal matches Steping-stones. - Charlie could reach some point where the Goal will be within the reach (by collecting and building-up Steping-stones), he will get bored, or he will feel his like life no longer has a meaning, or get a mid-age crisis, or something like that. Fig. 2. Goal is trivial. - Charlie's Steping-stones might weaken, so he will no longer be able to reach his Goal. Let's say he will get lazy, come up with some good excuses, or drink his brain off, or something like that. Besides, Charlie might not know something about himself. When it become apparent, Charlie's Goals and Steping-stones no longer match. Like, if Charlie was sure he is a great artist until he bring his paintings to a professional exhibition and see what others can do, or he thought he is a hero until he faced real dangerous obstacles. On the other hand, he might be shy about himself, and set modest Goals, while he has a real great talent indeed, and his too-low Goals are just silly. When Goals are no longer reachable with selected Steping-stones, change Steping-stones. When Goals within the reach, and can be achieved effortlessly, change Goals. New goal shall not block the following Goals. Examples: illegal immigration blocks most of future Goals in the target country; building muscles with illegal chemicals will block future sport career. It sounds logical to separate tactical and strategical Goals. Then we can say, that Steping-stones for tactical Goal shall not block the way for strategical Goal. 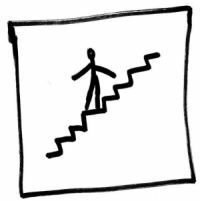 Ideally, short-term Goal Steping-stones shall become a part of stairs to the strategic Goal. The problem is - strategic Goal is not always immediately clear. Sportsman can quit sport performance and start building her school. Scientist can switch to peace movement, ecological problems, future of the planet. Businessmen can switch to philanthropy. What will be the next big Goal is hard to guess. Nevertheless, everything so far looks logical and quite straightforward. What is the problem then? Mismatch between Goals and Steping-stones is not evident even when you looking from the outside. For Charlie, it is extremely hard to notice that his Goals and Steping-stones no longer aligned even if he pays attention to it. Most of us are not even aware that we got to. Usually, Charlie just passes the end of stairs and falls over and down. Scenario when he stops at the end, and pretends he is still moving forward, is not much better indeed. Life gives Charlie some hints that something goes wrong, but Charlie ignores them. Why? There is an excuse - it is hard to tell these hints apart from just some random events. 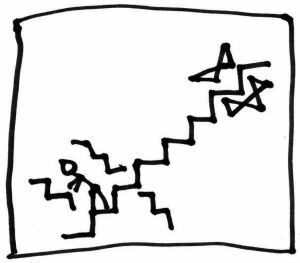 But that is true only in the very beginning of the stairs, when Goals and Steping-stones mismatch is not very evident yet. 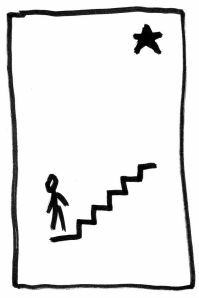 When Charlie is at the end of stairs, and about to fall down, it is already absolutely clear, that something is not right. But Charlie keeps fooling himself and rushes forward. Why? This is a big separate topic outside the scope of this article. Let's just keep in mind, that this happen consistently. What Charlie can do about it? There is a simple and efficient solution - Charlie shall watch himself, his Goals and his Steping-stones from outside, and pretend that it is not about him at all. He can pretend, that it is a math exercise from a schoolbook or something. Then he has put it all on a paper, do analysis, and accept results as they are, not as he wish they are. Then he got to grab another piece of paper and come up with some kind of solution. It is up to Charlie which path to choose. Let's imagine he has chosen the grow. 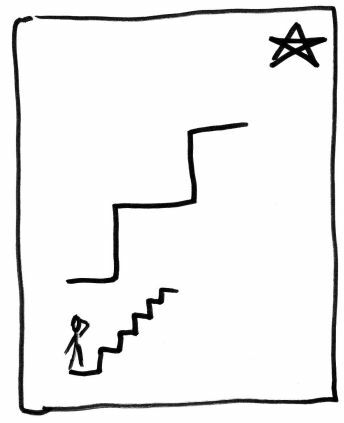 His second star will be bigger, than the first one and much higher, but stairs are bigger too. Current Charlie just cannot use it. However, at the time when he reach his first Goal, he will grow, and will be ready for the second one. Therefore, Charlie shall not afraid to set distant ambitious Goals and shall not worry how he will reach them. He shall just keep moving to his next Goals and grow, and on the long run he will be fine. What if Charlie has no Goals? Unfortunately, it happens way too often. Charlie get stairs, and starts climbing (because they told him so, or because other guys go). 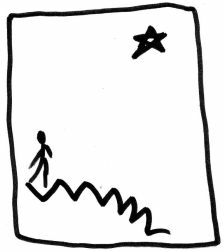 Soon his subconscious mind realizes, that there is no star ahead, and decide, that keep climbing is pointless, and start slipping back. Charlie might be surprised why he fails over and over. He tries to do this and that, just like the other guys, but it does not work for him. Fig. 7. Charlie with no Goal. There is one less obvious case. When Charlie starts, or when he starts the next level, he likely does not have enough stepping stones to reach the goal. He starts building them up. Sadly, way too often Charlie get so involved, that he keeps building stepping stones and abandons the goal for good. There are two problems with that. First, Charlie get stuck. Second, the goal is something new, while stepping stone is something known. Goal will benefit people much, much more than a stepping stone. It is sad to watch Charlies steam fruitlessly going through the whistle. Fig. 8. Charlie abandons goal for a sake of stepping stones. 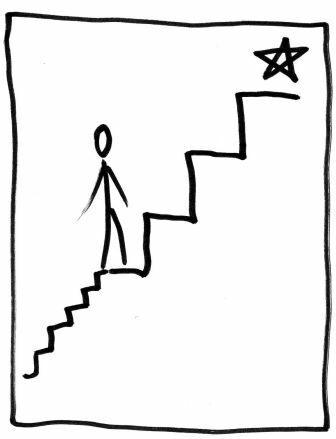 Way too often we think it is a star, while indeed it is just a stepping stone. Even if we are very smart otherwise. Watch out. Sorry, this is important, so let me repeat: please make sure, what you think your Goals are not just Stepping-stones indeed. Our research would not be complete without extreme cases analysis. Infinitely powerful (absolute) Steping-stones is a magic wand. The problems magic wand holders face are stemmed from the fact, that the Goals are inadequate, and the person is still small spiritually. Absolute Goals could be negative and positive. 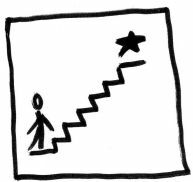 Absolute positive Goal is to turn all the people into infinite grows mode, make them infinitely go upstairs, reach bigger and bigger Goals and grow. Absolute negative Goal is to turn all people into degradation and degeneration mode. From the Christianity point of view, positive Goals are Divine (spiritual growth), while negative are Evil and Satanic (degradation and degeneration). The bottom line is - the only adequate Goal for magic wand holder is turning all the people into infinite perpetual spiritual growth mode. On the lower level religious and some other spiritual growth look different, but on higher level they are the very close. You still have to match the same very tight requirements to be able to handle magic wand. The other way around, to turn the humanity into perpetual growth mode, Charlie needs Steping-stones close to magic wand. And, as I mentioned above, Charlie himself shall be very, very big. The bottom line of the bottom line is - our aim is to move up and grow. We shall set the right Goals, choose the right Steping-stones, and watch them to make sure they match.